The Aireator® is the original DeFeet sock, keeping athletes' feet comfortable and ventilated for years on end. Combined with a bold design from Ridge Supply, these 6-inch socks are sure to grab the attention of both drivers and cyclists alike. They're knit with CoolMax® EcoMade™ fibers for excellent moisture-wicking, while the open-mesh ventilated top-foot provides superior airflow, giving the Aireator® its name. The lightweight construction makes them a good option for close-fitting cycling shoes, while a reinforced heel and toe still ensures long wear. 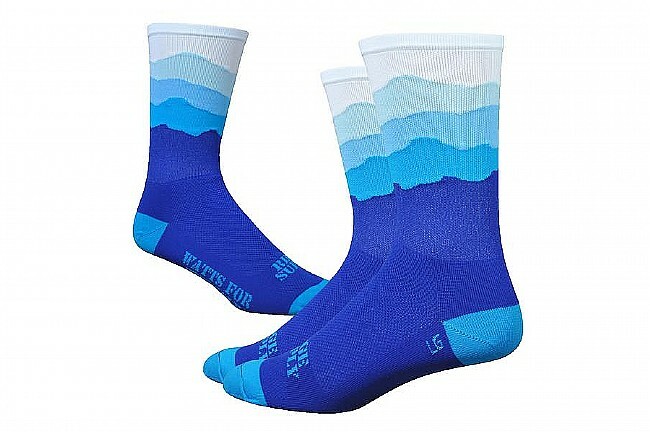 These socks are a nice complement to my blue Shimano S-Phyre road shoes. The blue gradation up to the high-vis yellow at the top have elicited nice comments from fellow cyclists. These are rather tall at six inches, so it's important that I wear shorter socks on other days to preclude developing a high tan line on my ankles. I have the all blue ones and really like the style. They have stood up well to a few thousand miles of cycling at this point. I have tender toesies and need a sock that doesn't restrict them. These socks are the bomb. Stylish as well. 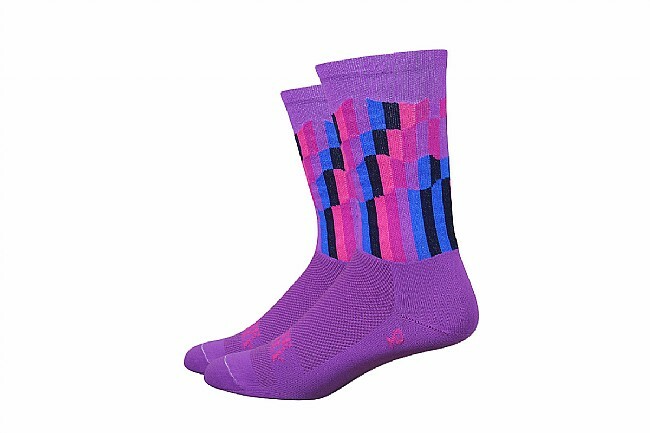 The graphic socks tend to be a little tighter than the standard defeet socks, but worth it! These arent the most comfortable socks Ive ever worn, but they do provide some cheerful motivation for those cold winter mornings when Im headed to spin class in the pre-dawn hours. I wouldnt choose these for rides longer than a couple of hours. The six inch cuffs fall right below the calf, and the colors schemes available allow a rider to be seen and match a variety of kits. 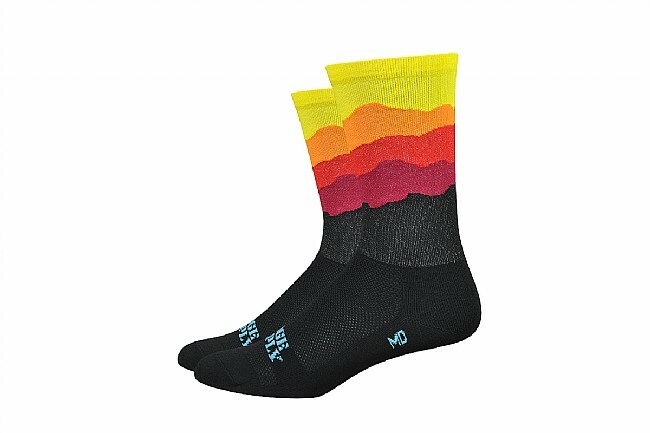 I have every design of Ridge Supply socks, as well as one of the first runs of their new kits. I know the proprietor and only employee, and he has designed his apparel based upon both the skyline of the Blue Ridge mountains and the need for cyclists to be visible. These are nice socks, but I found them to be too tall, and the top elastic digs into my calf. The 5 Aerator socks are much more comfortable. These socks let me be fashionable while being seen!! Comfortable and cool. Awesome socks that get lots of compliments! 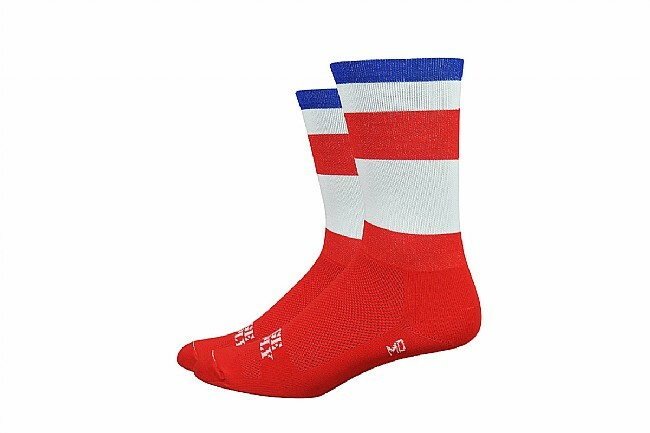 These socks are the great quality that you would expect from DeFeet. The rainbow color is bright and noticeable and they are great looking while pedaling your bike.